since im waiting for my bixler kit to arrive and after a big sunday lunch watching glider videos, i decided to start my Alula scratch build. the ARF kit you can get at Dreamflight, but hey ... i was trying to get busy in the rainy afternoon. 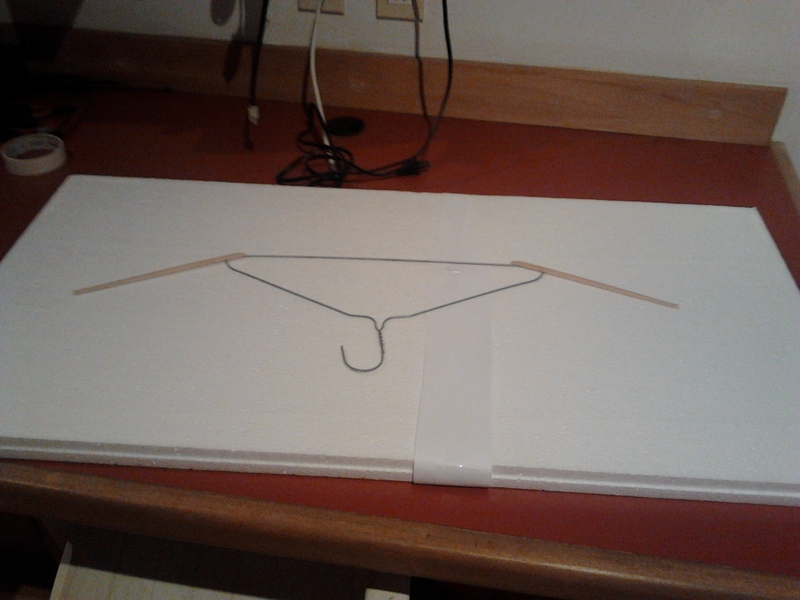 then i decided to drop the metal hanger and use only the Hashi sticks glued together as a Spar. I glued the 2 pieces of cheap foam with the spar between. ALOT of sanding going on and still alot of sanding to do !! 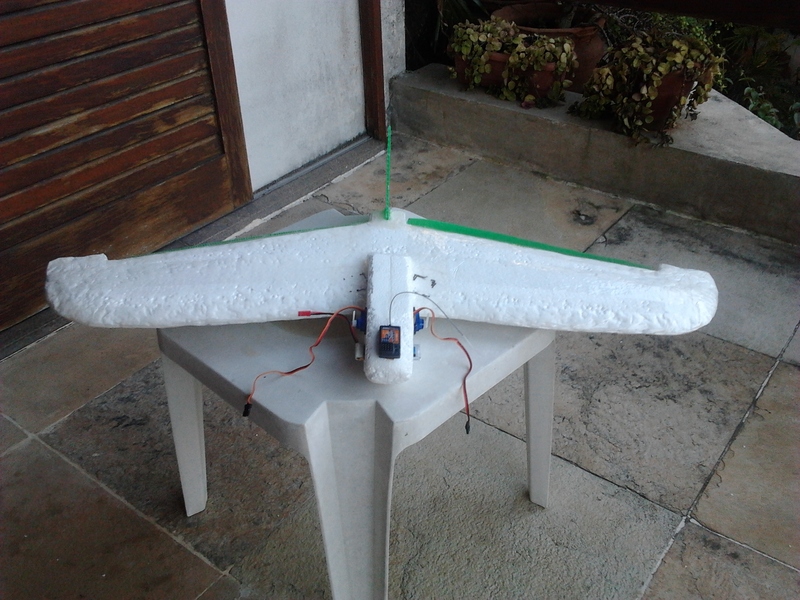 the wing without the pod, feathers and eletronics measure 800mm and weight 70 grams. 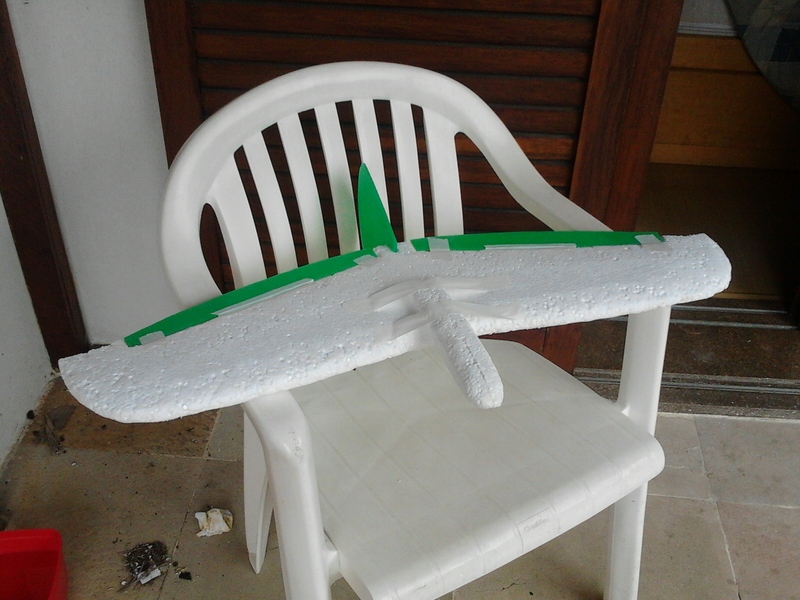 after i reach my desired wing profile (eye measuring) I plan to coat it with packing tape to add strenght. this is my first scratch build, i hope it flies !!! any tips ?? You've certainly been very busy. As an Alula owner (V1, not the current evo version) I can tell you that a lot of design development has gone into the Alula to make it such an awesome glider. It is a very detailed design and as such is a specialist glider. 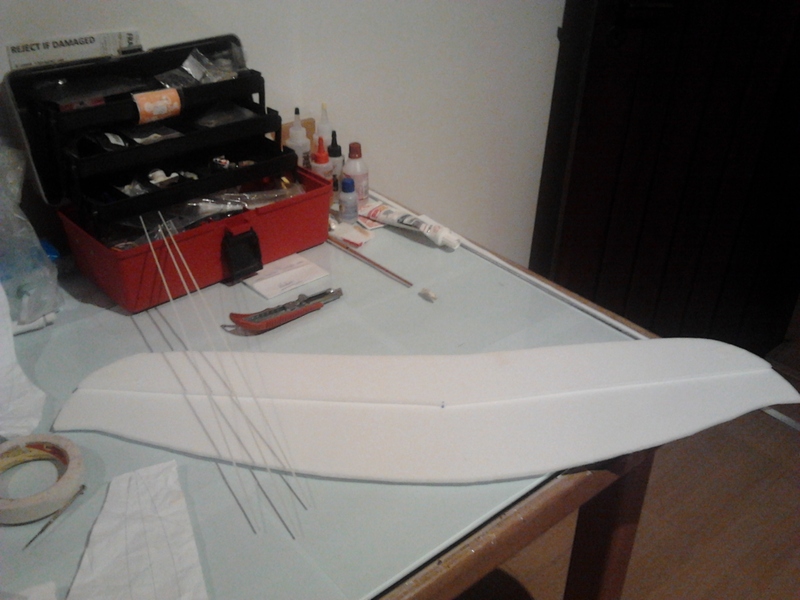 You have done an awesome job replicating the planform there, however to really get the right airfoil shape and consistency you need to blow-mould or hot-wire cut the wing. Cutting and sanding might get it close, however each side will be different and therefore provide lift and response in a different way. All these little imperfections add up to make the aircraft a dog to fly! Early in my flying career I took a lump of EPS and sanded it into the shape of a Zagi. I covered the lot in tape and went to fly it. The launch went well and then I tried to turn. It wouldn't respond to elevon control at all. Those hours of toil were thrown in the bin. 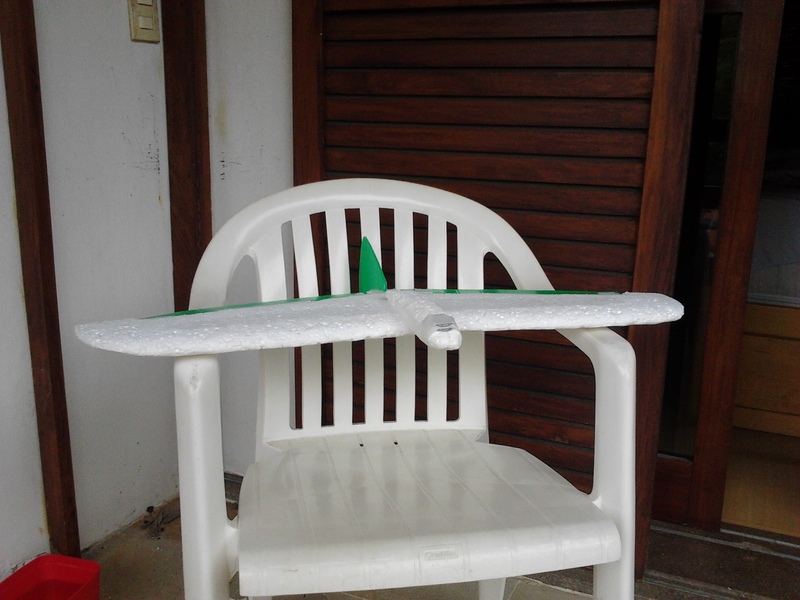 The pibros is an awesome cheap sloper and rather than relying on complex airfoil and planform (like the Alula) the design is simple and copes well with a flat-bottom airfoil. Not long after my home-made zagi disappointment I took a slab of EPS similar to what you started with and cut a triangle to the proportions of a pibros and at 1m wingspan. It was nothing more than a flat bottom, rounded top and elevon chunk of foam. Because it is a simple design I ended up with a rather good glider which taught me how to slope soar. In fact it lasted me a long time and experienced slope pilots were impressed with it. Again, no offense! I want to show my own experience so to help you avoid disappointment. And I think you will like the Pibros! I have heard about the Pibros and i recognize its a far better idea to start with it and grow from there. By any means i got offended with your Post, quite the opposite: i was thrilled with your inputs. 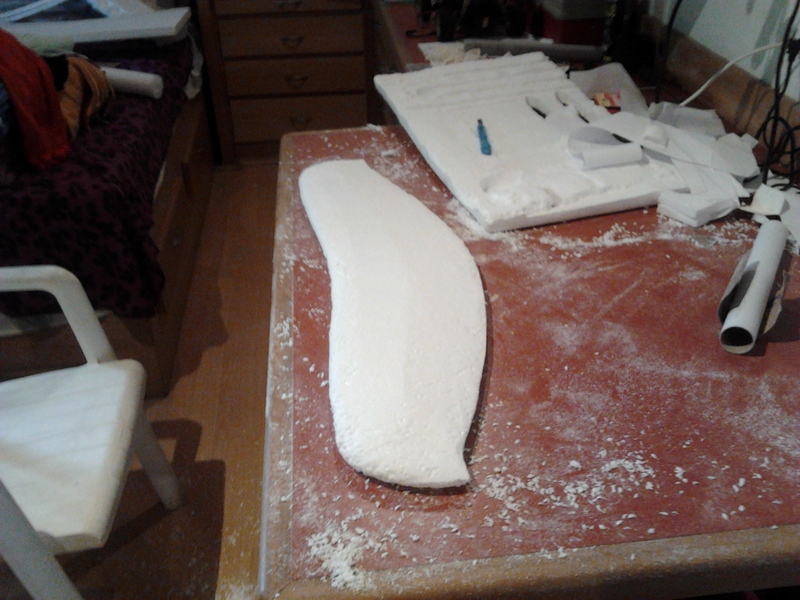 Anyway, i found my desired airfoil shape, my room is filled with foam dust and would be a shame not to put the Alula together since its 85% done; already have the feathers installed and the elevons cut. If i got more than 3 sucessful throws/flights with it, im happy. Its been a learning experience, if this project sinks nose down and explode into a million foam shredded pieces i'll laugh and move to the next project. Ill try to post more pictures of the actual build state. keep the valuable tips coming !! the hinges and the pod are just tied for the picture and balancing, ill work on a better fixing soon. im ready to crash, just waiting for the eletronics ..... after this ill try the pibros. Just what I didn't want to do! Though I'm glad that you aren't offended by my post. I wrote about my experience to show that I'm just as 'dumb' - but I reckon 'adventurous' is a better description because we gave it a go and learn from our experience. He has done very well! i made a couple of free throws, no eletronics, it did glide !! added more weight to the pod to correct CG. The pod is a weak point on the Alula. You might want to go ahead and put some some fiberglass or carbon rods along the nose since you need some weight up front anyway. The force of throwing the Alula causes the nose to flex outward, after a while it just breaks off. Easy to glue back on and still flies fine after being repaired. 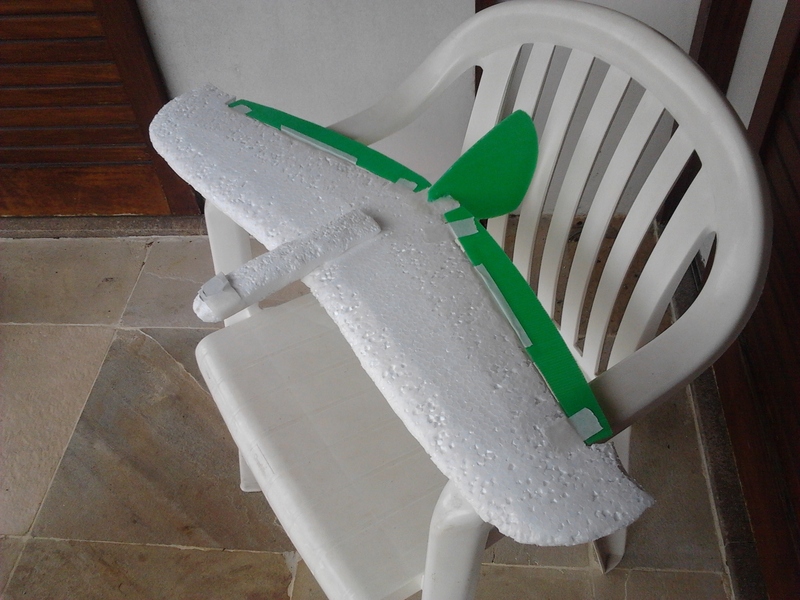 Im thinking in a way to DLG this, lots of reinforcement will be needed around the wing tip not to tear it away .... another solution is to use the HL method with the rubber band and fishing line. 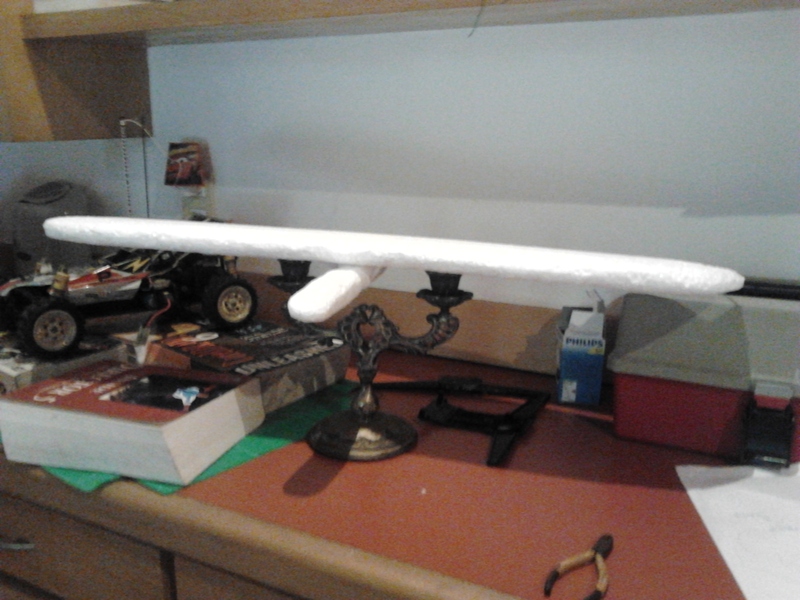 eletronics rehersal to weight and balance; linkages done, taped all around the wing. SPOT ON !!! that exactly what happened !! this time i fixed the servos more to the front - inside de Pod now - and made slit for the battery; still need to develop the new pushrods. 5 months have passed, lots of projects running pararel but the desire to have the exquisite (flying) ALULA never died. 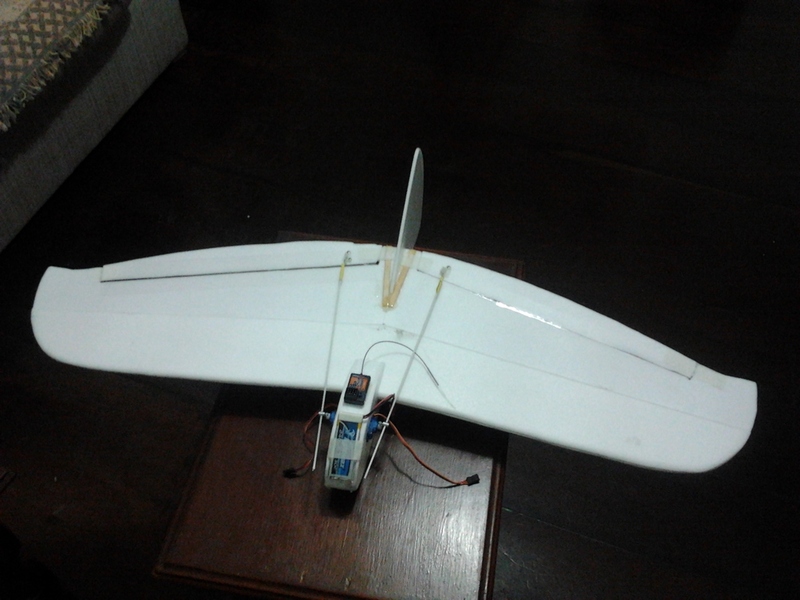 here it is the ALULA V2 with Kfm2 Airfoil. Looks good. 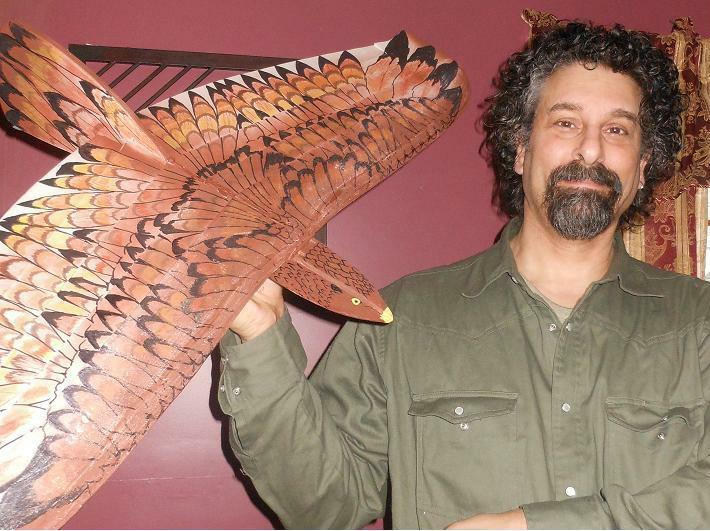 Makes me want to actually finish my red-tailed hawk glider I started months ago. Just need to glue the parts together after setting the right CG; center the servos and cut the excess on the pushrods. did a hand throw with the elevons fixed in the living room and it glided across !!! Just stumbled onto your thread.... very nice and that's a good AUW. That's my Alula video you got on page one as inspiration... thanks. thank you very much for your video and your post here !! 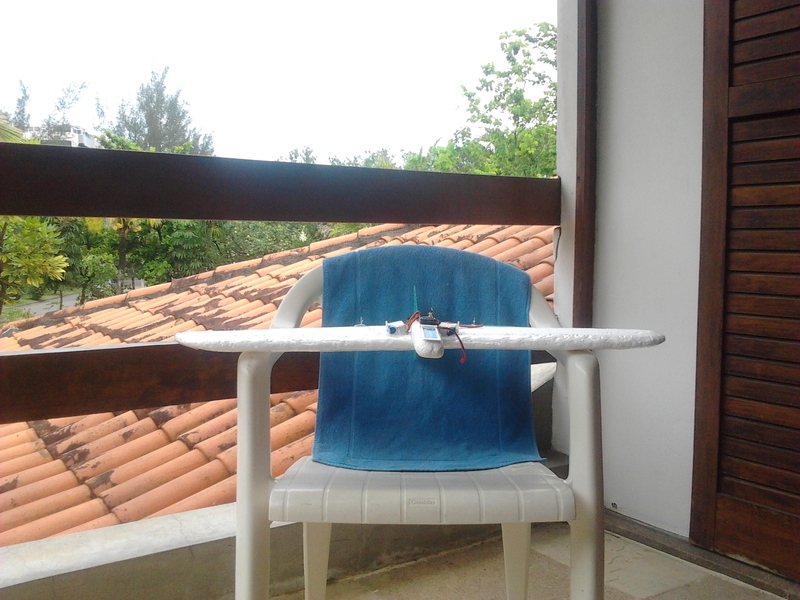 unfortunately my alula didnt flew too well because i made the pod too big; it did flies but when it looses the inertia it falls like a brick ... maybe i need a better landscape + strong winds to test it properly. PS: WELCOME TO THE FORUM !!!! 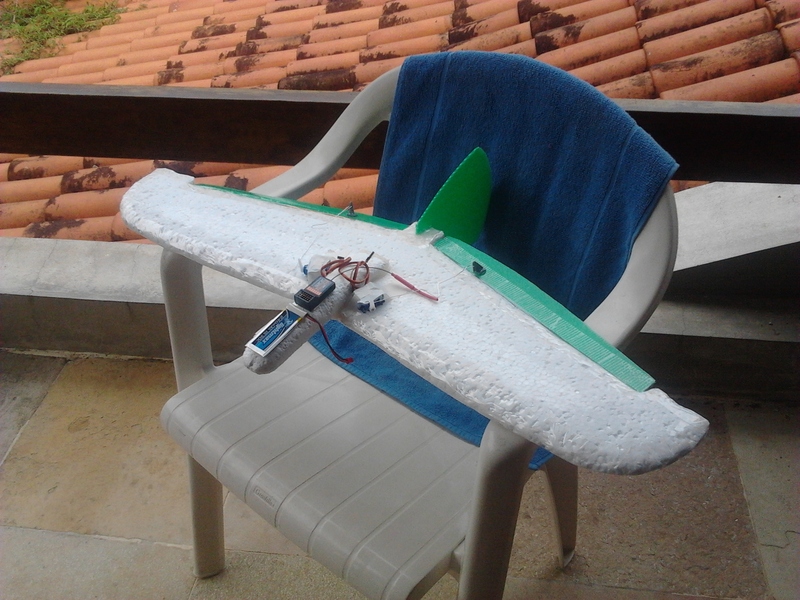 I decided to see if I could make a clone of the Alula glider.. so I found Dave Reap's plans online in the RC Groups forum.. and gave it a shot. Dollar tree foam board was used throughout. The wing uses a 4 layer KFm airfoil. I would recommend peeling the paper off of these stacked layers to make sanding the leading edge a bit easier, although the hot glue will still be a bit of a pain to sand through. I also used the same technique as on the FT Nutball to attach the body/fuselage. Wooden skewers up front and a loop in the back. A base coat of brown was sprayed on and markers were used to create the detail. It's a simple 2 channel - but my radio is an older one without mixing - so - I'm awaiting a Hobbywing V tail mixer that I ordered so I can proceed to flight testing. 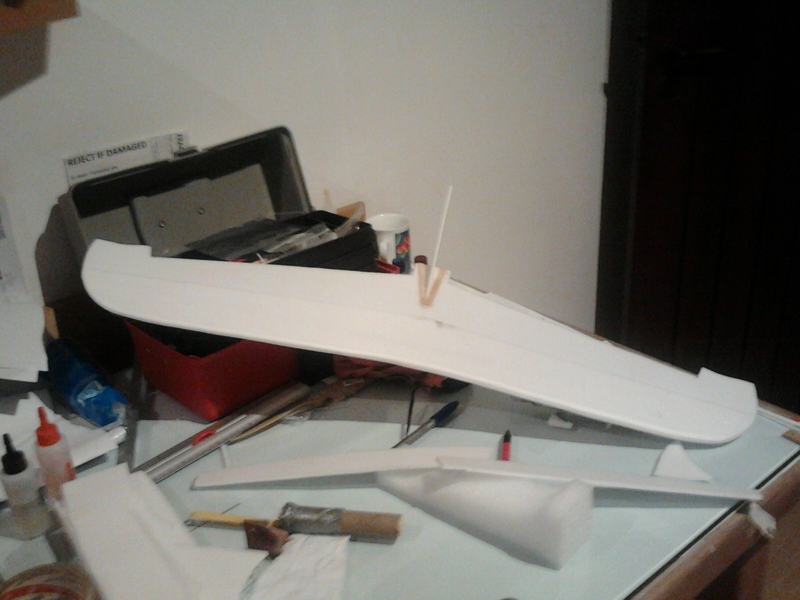 I'm sure it will be heavier than the original, but - I'm hoping it will fly well enough to get me started in soaring.